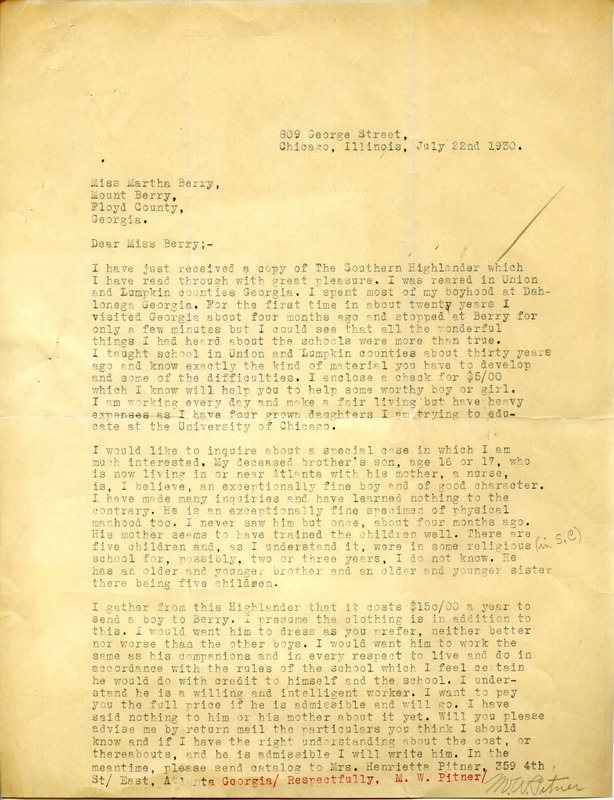 This letter is written to Martha Berry from M. W. Pitner about a boy that Pitner wants to send to the Berry Schools. According to Pitner, the tuition at Berry at this time was 150 dollars. M. W. Pitner, “Letter to Martha Berry from M. W. Pitner.” Martha Berry Digital Archive. Eds. Schlitz, Stephanie A., Jordan Brannen, Chelsea Risley, Austin Amandolia, et al. Mount Berry: Berry College, 2014. accessed April 21, 2019, https://mbda.berry.edu/items/show/13729.